$10 Off $25 At Kohl's! PLUS More Big Savings Scenarios! You are here: Home / Great Deals / $10 Off $25 At Kohl’s! PLUS More Big Savings Scenarios! $10 Off $25 At Kohl’s! PLUS More Big Savings Scenarios! Kohl’s is having a great sale this weekend! Plus, there are lots of stackable deals! 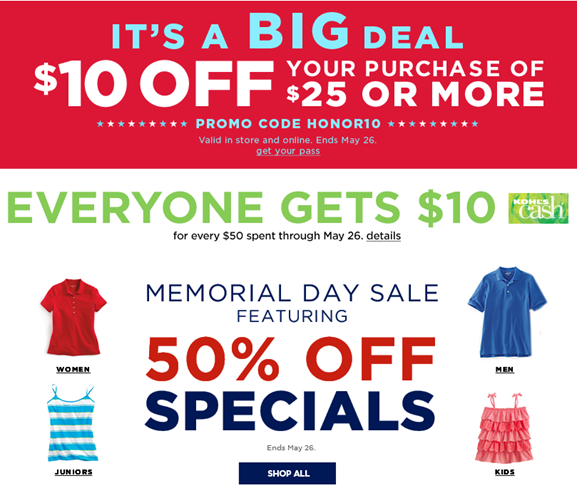 First, you can get save $10 off a $25 purchase when you use code: HONOR10 at checkout (exp: 5/26). You can also print a pass to use in-store, too! You can also stack codes: HONOR10 and MEMORIES to get an additional $10 off $25! Make sure you have at least $35 in your cart when you stack those codes because you need to have $25 still left in your cart when you use the 2nd code. So, it will take $10 off the $35 you have in your cart and then when you apply the 2nd code, it will take of an additional $10 making your total just $15 for $35 worth of items!! There’s also a 20% off code: SAVE20 that you can use with either the HONOR10 code or the MEMORIES code – you can only use 2 codes at checkout per order. On top of all of that you get $10 Kohl’s cash for every $50 you spend right now thru 5/26/14 in-store or online! There is also another code for the $10 off $25: TEN4YOU and a 15% off code: SUNSHINE and you can print it, too!